Accessibility: The main space is wheelchair accessible throughout, the washrooms are on the same level and semi-accessible. There are two gender neutral washrooms, and the larger of the two may accommodate some but not all folks who use electric or manual wheelchairs; the door swings inward, there is minimal clearance once inside, and there is little space between the toilet and the sink to transfer. 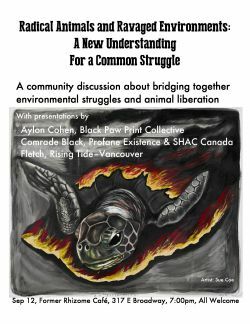 Hosted by The Black Paw Print Collective and Rising Tide - Vancouver, Coast Salish Territories. Join us for a community discussion about bridging together environmental struggles and animal liberation. The Black Paw Print Collective is an anarch@-feminist collective devoted to total animal, environmental, and human liberation through direct action and education. Rising Tide: Vancouver Coast Salish Territories is a grassroots environmental justice group committed to fighting the root causes of climate change and the interconnected destruction of land, water, and air. Accessibility information: The main space is wheelchair accessible throughout, the washrooms are on the same level and semi-accessible. There are two gender neutral washrooms, and the larger of the two may accommodate some but not all folks who use electric or manual wheelchairs; the door swings inward, there is minimal clearance once inside, and there is little space between the toilet and the sink to transfer.